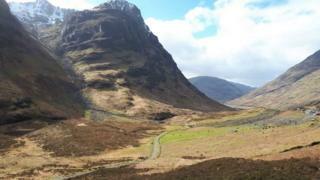 A selection of your pictures of Scotland sent in between 22 and 29 March. Send your photos to scotlandpictures@bbc.co.uk or via Instagram at #bbcscotlandpics. 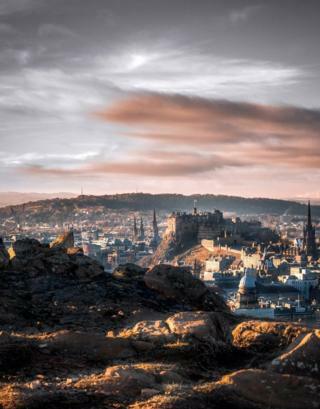 Image caption University of Edinburgh student Joshua Fabian snapped this sun-kissed shot from Salisbury Crags, in Edinburgh. Joshua, from the US, said: "What I love about this picture is the way the light from the sunset made the city look like something straight out of a fairytale, with shades of pink and blue. Which in my opinion captures the true essence of what this city is, a fairytale and dream to look at. " 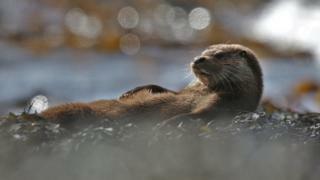 Image caption John Watt noticed this sleepy otter lazing on the seaweed at Loch Visions, Argyll. 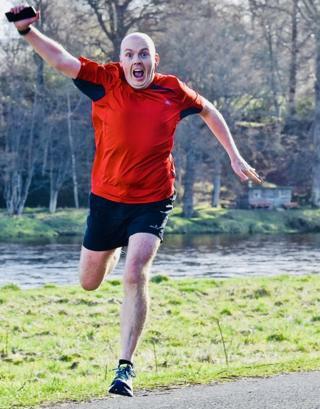 Image caption Perth park runner Bayne Shaw gets full marks for living life to the fullest as he enjoyed his Saturday morning run along the banks of the River Tay in Perth. This brilliant moment was captured by Roy Mitchell. 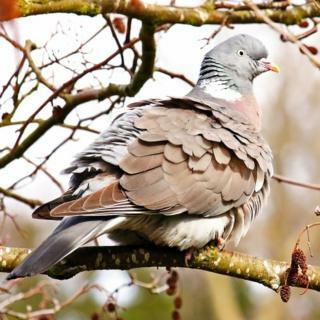 Image caption Graham Ramsay spotted this wood pigeon as it clung to an alder tree on Norie Miller Walk, Perth. Image caption Margaret Gilhooley took this shot as she marvelled at "magical" Glen Coe on an afternoon journey home from Oban. 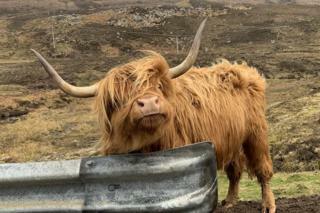 Image caption Maryla Betkowska from Glasgow managed to capture this perfect shot of a "disgruntled" Highland cow on the Applecross coastal road in the Highlands. 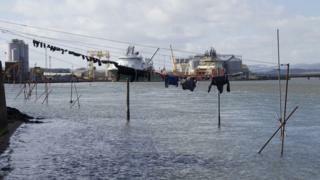 Image caption Frances Menter, from Broughty Ferry, points out that you'd need good clothes pegs for this washing line at the entrance to Montrose Harbour. 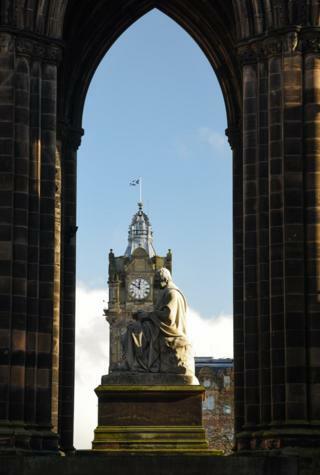 Image caption Both are subjects that frequently attract the photographer's lens - but Brendan Scott has captured The Balmoral Hotel and the Scott Monument in Edinburgh at an undeniably satisfying angle. Image caption Marlyn McInnes rounded up these Scottish Black Face Rams, who she calls the "three amigos", at Forter Farm, near Kirkton of Glenisla in Angus. 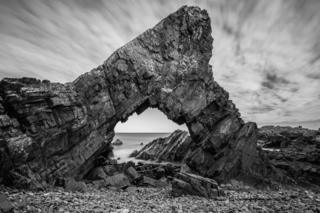 It was a blustery day but worth the venture outdoors for this brilliant shot. 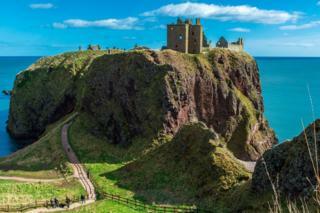 Image caption Robert Pender snapped Dunnotar Castle on a particularly bright afternoon this week. 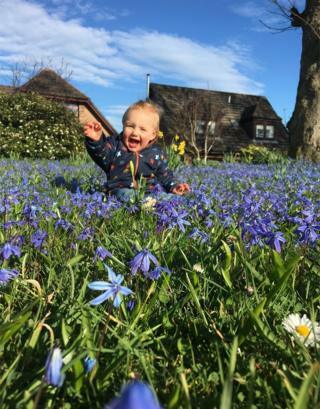 Image caption Rachel McGuigan captured her delighted son Harvey playing among the bluebells in Arbroath. 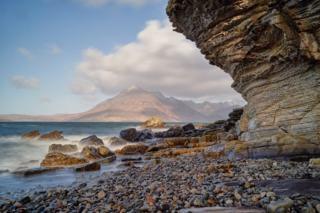 Image caption This beautiful pebbled scene was captured by John Fraser on Elgol beach, Skye. Image caption Sylvia Beaumont sent in this celebration of Spring. 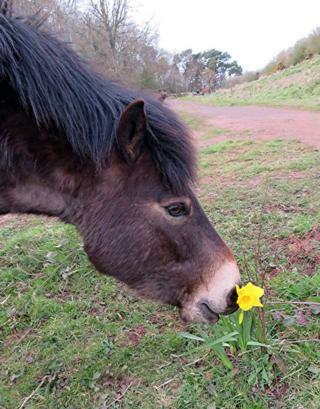 She said: "I took this picture a couple of days ago of an Exmoor pony checking out the only daffodil at North Berwick Law!" 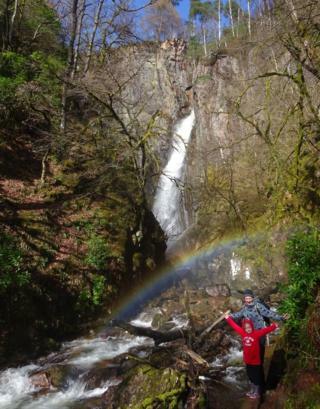 Image caption Jonathan Henderson captured this colourful moment at the Grey Mare's Tail waterfall in Kinlochleven. He was visiting the site with Lynda and Kayla on the hunt for treasure - when a rainbow unexpectedly appeared. 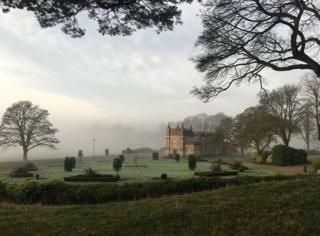 Image caption Early riser Finlay Morrison took this shot at Baxter Park Pavilion in Dundee while out walking his dog Cooper. He said: "It looks more like a Constable painting rather than a photo (although the traffic cones - far left - are a bit of a giveaway)." 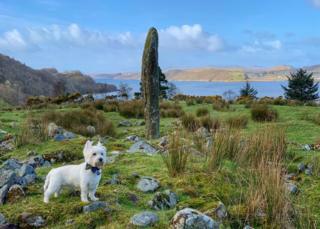 Image caption Alex Grant from Edinburgh captured Casper - also known as "the Wee White Dug" - as they visited the Bronze Age complex at Kintraw en route to Argyll. 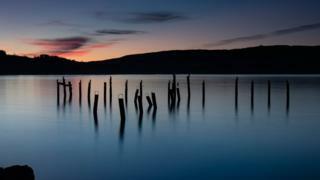 Image caption Richard Tod just managed to grab last light at old Salen Pier on the Isle of Mull. Image caption The colours alone in this shot are spectacular but it may also be of interest to "set jetters". 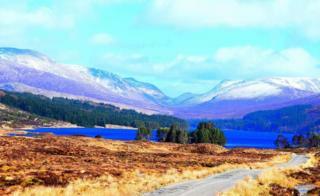 Andrew MacLean took his photo looking down Loch Ossian from Corrour station in the Highlands, which has an iconic appearance in Danny Boyle's Trainspotting. 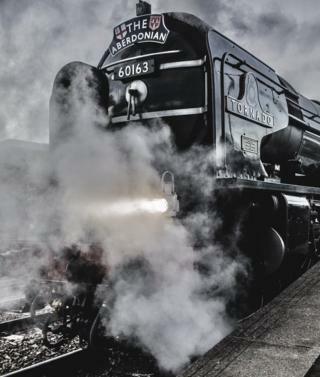 Image caption And another one for trainspotters - Colin Morrison captured The Aberdonian setting off on the first of five planned round trips from Aberdeen to Edinburgh this year. Colin said: "The trains being hauled by LNER A1 Pacific, Tornado the first locomotive of its type to be constructed in the UK for 60 years. These round trips are made possible by the refurbishment of the turntable at the former Ferryhill engine sheds." 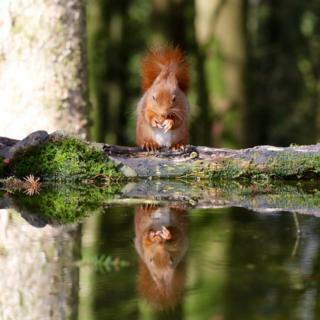 Image caption Andrew Murray caught this fluffy red squirrel during a reflective moment. 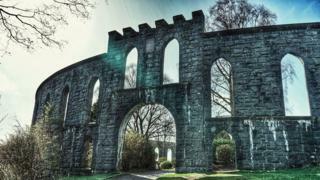 Image caption Owen Devlin and his partner enjoyed a weekend trip to Oban this week where they captured a striking light at McCaig's Tower. 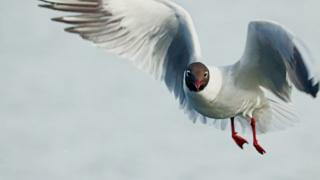 Image caption Jacki Gordon from Glasgow has spent the last week indoors with a broken foot - but managed to capture this black-headed gull while being pushed around Hogganfield Loch. Image caption Andy Swinhoe took this moody shot of the Needle's Eye Rock, next to Tarlair outdoor swimming pool in Macduff, Aberdeenshire.